Let others eat turkey – you’ll be the one wearing it! 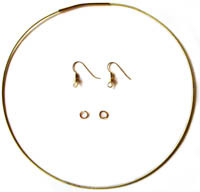 Classic, minimalist earrings will flirt with your shoulders while the choker highlights the delicacy of your neck. And it’s all due to the magic of turkey wishbones, a shape at once familiar yet unexpectedly sculptural and elegant. 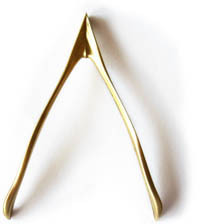 Of course – why waste a perfectly good wishbone by tugging it in half? And what better way to celebrate the birth of the Christ child than with a piece of dead gobbler festooned with rhinestones? As inspiring as Mrs. Abell’s original craft is, we thought it would be even better if transformed into a matching earring and choker set. That way the joy of the season can be shared with everyone you meet, not just family members. We’ve also taken liberties with her original intent, that of recycling bones from the family dinner, by substituting plastic wishbones from LuckyBreakWishbone.com. Not only does this eliminate the need to roast several birds for your project, but it’s more humane, more sanitary, and guarantees you’ll get a matched set. Drill a 5/64″ diameter hole side to side through the top of each wishbone. 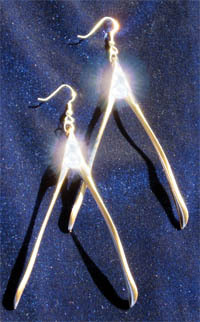 Double check to ensure that the holes on the bones for the earrings are large enough to thread the jump rings through. Similarly, the hole for the bone for the choker should be large enough to thread the choker through. 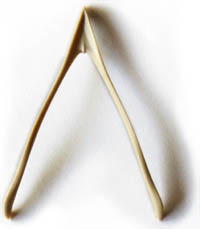 Wash wishbones with mild dish soap. Dry thoroughly. Don’t rush the drying – any water, including water in the drilled holes, will prevent paint from adhering. Apply several thin coats of paint to the bones, allowing each coat to dry before applying a new one. Dry the paint thoroughly overnight before flipping the bones over to paint the other side. This is a good time to paint the remainder of the plastic bones you purchased, as well. They can either be turned into Christmas ornaments la Vivan Abell or, with the assistance of a pin backing, make futuristic tie tacks or Sci-fi style uniform badges for the fourth grade play. Or, if you’ve purchased a large package, they can be fashioned into a spectacular star for the top of your Christmas tree. A cotton swab is very useful for applying the adhesive, and a pair of tweezers is helpful for positioning the rhinestones. Note: If the painted finish gets a bit marred after gluing on rhinestones, mask off the rhinestones with a small amount of tape or modeling clay, then touch up the wishbones with paint. 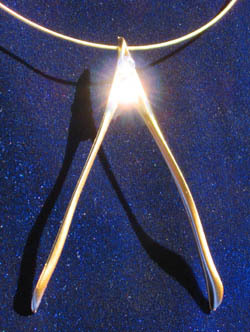 To complete the choker, simply thread on one wishbone. 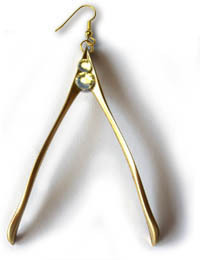 Attach the other two wishbones to earring finders with jump rings. Ready … set … dazzle!